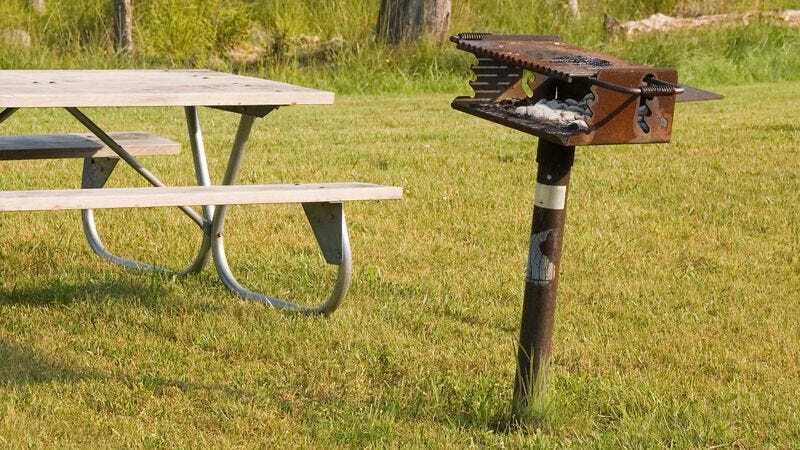 GREENVILLE, SC—Scrutinizing the ashes of charcoal briquettes inside the weathered firebox, motorist Matt Palmeri reportedly deduced Thursday that people traveling southbound along Interstate 85 have apparently been using the rest stop’s barbecue pit. “I noticed some charred remnants of meat on the grate, so I can only assume that someone decided to stop at this rest area during their trip and use this thing to cook up some burgers or chicken,” said Palmeri, surmising that the individual must have consciously chosen to pull off the highway and retrieve meat from their vehicle in order to have a barbecue in front of an overflowing, rusty garbage can and a succession of highway travelers walking to and from the public restroom. “There’s a couple travel plazas they could have stopped at for a quick meal, but I suppose that whoever’s been cooking here brought along charcoal, lighter fluid, and grilling tools because they had planned ahead of time on having maybe an hour-long cookout on this patch of grass between the travel information sign and the woods. Then I guess they just got back on the road.” Palmeri then admitted he was impressed that someone had successfully managed to grill food on the barbecue pit, noting how it was jutting out of the ground at a 75-degree angle.